600 backers pledged CA$ 10,637 to help bring this project to life. Customatic - Make Windows 10 look and work the way you want. As newer Windows versions get released, users get less and less ways to customize the look and functionality of their PCs. Customatic is here to solve that. We are not only bringing features that PC users have been longing for a long time but also new and amazing ways to change your system's behavior and look to your heart's content. Themes are an important part of the user experience on a computer. While the default Windows look is fine as it is, it gets boring and annoying as you spend more and more time on your computer. Sadly, theming capabilities have been reduced to a point where it is almost impossible to change the overall look for recent Windows versions. 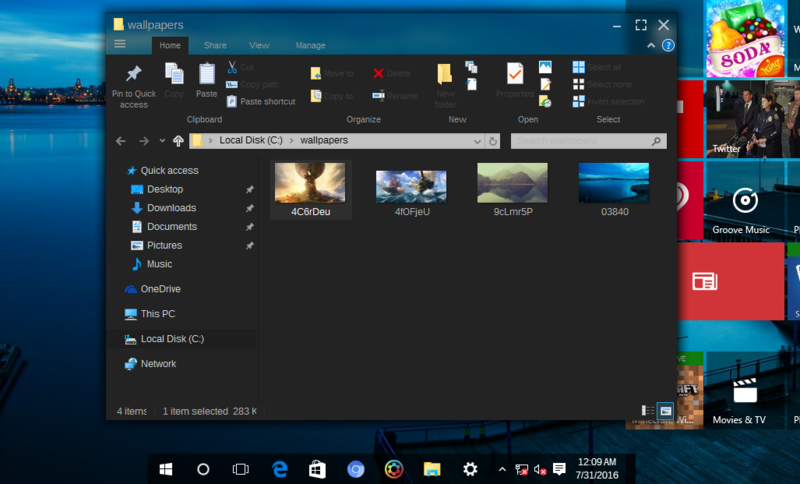 Customatic brings full theming back on Windows 10 with seven included themes and you can make your own with our Theme Editor. 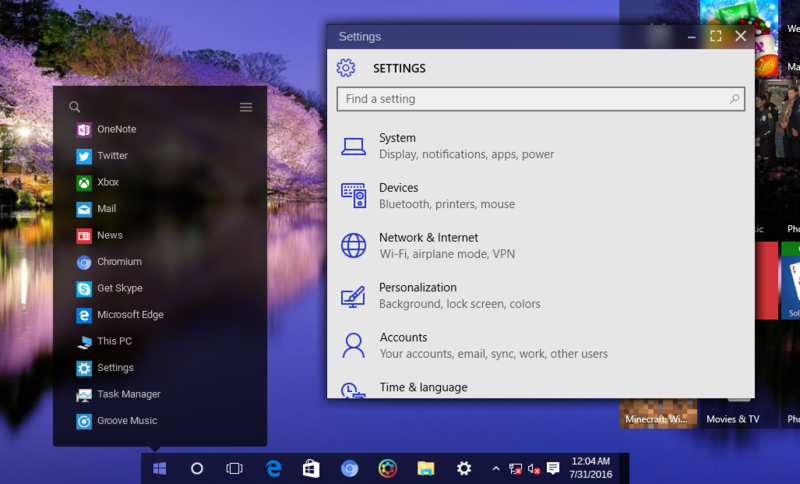 A lot of people were asking for Live Tiles on their Desktop. It seems natural, since Live Tiles are the replacement for the old desktop widgets. With Customatic you can show Live Tiles on Desktop, simply right click and select the option. You also can change their opacity and scale. 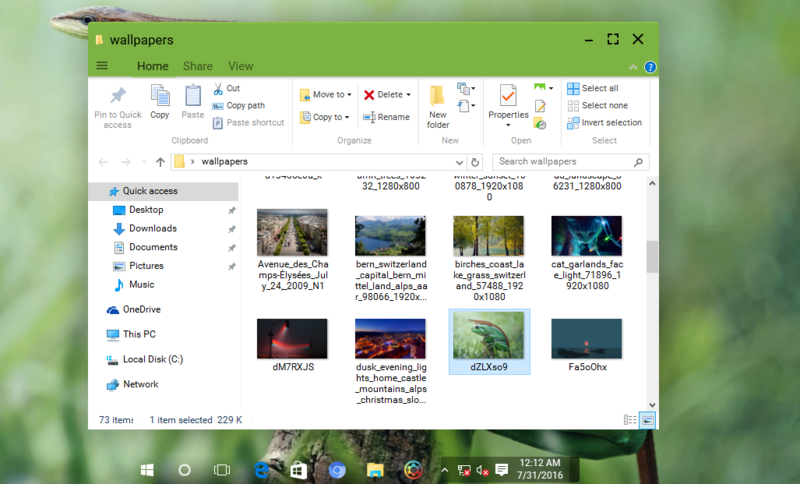 Choose from 3 different launchers or make your own using XML. Why have a one-size-fits-all solution for such a massive user base? 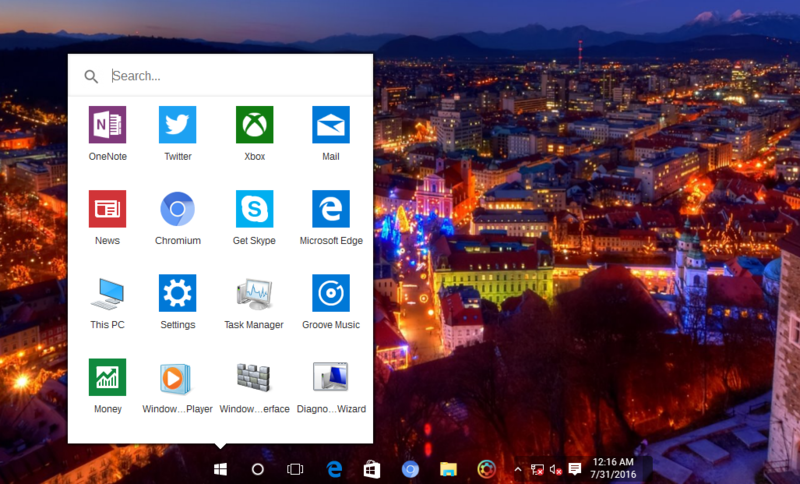 That's why Customatic adds highly customizable App Launchers, these can look anything like the classic Start Menu, a Start Screen or completely new configurations that you can create or download. You can enable Windows 7-style Jump lists and Live Previews. Per app window colors using the Material theme. The new app platform included in Windows 10 enables great app experiences across all Windows devices. That’s why Customatic adds support for theming on UWP apps, so they look consistent with the shell and regular Win32 apps. The ribbon shown with the Material theme. 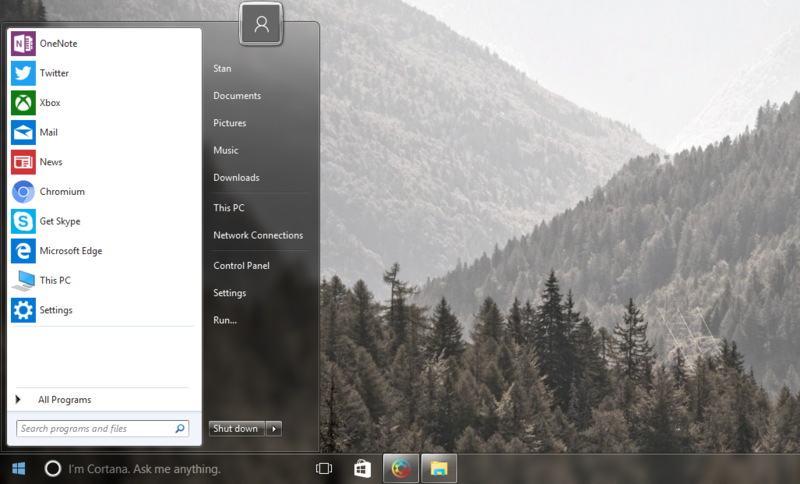 We are also including new tweaks for the Shell, Taskbar and Windows Explorer. Starting with automatically centered taskbar layouts, a feature that has been requested by Windows users for a long time. You can also restore the Windows 7-style context menus, jump lists and live previews, as well as resize and move the Action Center and other windows such as the Network and Date/Time Flyout. The Windows customization community is huge. That's why every tweak and feature that Customatic brings can be changed or turned off. Themes and Launchers can be created and remixed with our Theme Editor and using XML, respectively. And then you can share your creations in our community, available in our website. You can of course put them on your webpage or wherever you like. Our team has been using Customatic for a long time. It is extremely lightweight and it doesn't load unnecessary libraries into your apps, change any system files, or add any noticeable performance hit. We are making sure it is as stable as it can get, so you can focus on your apps and less on the system's annoyances. Customatic has long passed the proof-of-concept stage and every single feature listed here is working, today. But we're enlisting the help of Kickstarter to ensure the success and long-term viability of our software. We want to make sure we get the funding to finish development on Customatic so we can deliver our very best, cover software development-related costs and have funding left to deliver constant updates to support newer Windows versions given the current nature of Windows updates (one major update every 8 months, or so). You can also help us by spreading the word, sending feedback and any ideas/comments you may have. Disclaimer: Some of the wallpapers shown are not included with Customatic. All trademarks are the property of their respective owners. We have a beta version that albeit a few quirks is ready for prime time. Every single of these features work on Customatic today. We have so much more planned but we won't announce it until we have it 100% working. If you'd like to be part of our beta testing group don't hesitate to contact us. You will get the final version of Customatic with all its features, themes, launchers, desktop live tiles once it gets released as well as future updates. 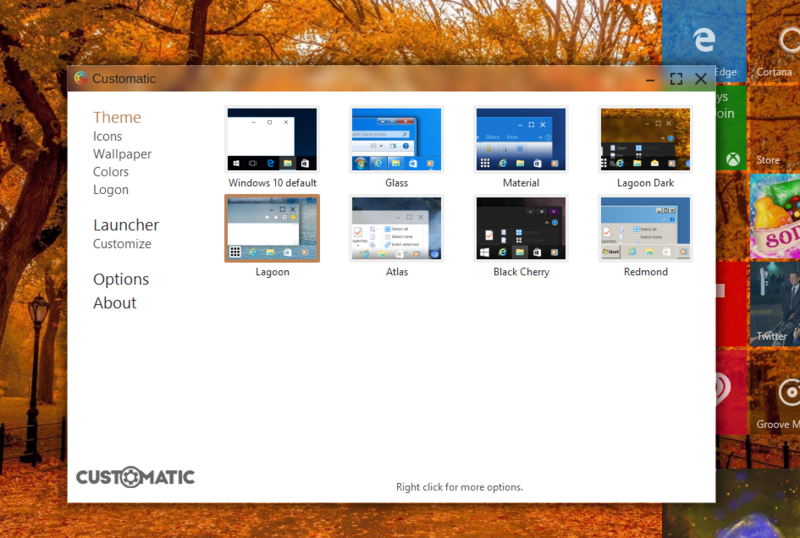 Get a copy of Customatic for Windows with all its features, themes, launchers, desktop live tiles and lots more. Beta version gets released to backers right after the campaign ends, and you'll get the final version some weeks later as well as future updates. Get Customatic for Windows with all its features, plus our full-featured Theme Editor so you can make your own themes. You can also share your creations with the community! Get your custom theme, made by us.